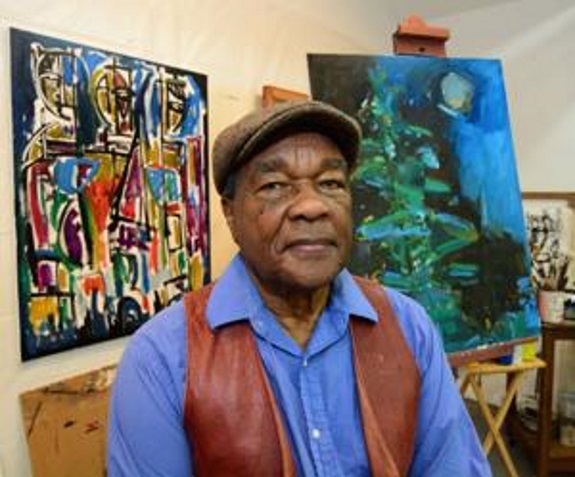 Bowling Green, OH -- David Driskell, one of the world's leading authorities on African-American art, will visit Bowling Green State University as the featured speaker for the closing of the School of Art's "So Much More: Ohio's African American Artists" exhibition. Driskell will present "Then and Now: Vital Topics in African American Art," at 5 p.m. Thursday, Oct. 18 in Olscamp Hall, Room 113. His talk is in conjunction with a significant 58-piece art exhibit that prominently features work by BGSU alumnus Bernie Casey. Casey, who was best known to the world as an actor and professional football player also was remarkably talented as an artist. He attended BGSU on a football scholarship and earned bachelor’s and master’s degrees in fine arts in 1961 and 1966, respectively. He died in September 2017. In addition to the featured Casey artwork, the exhibition includes work by 18 alumni, current students and other African-American artists from Ohio or with connections to Casey. "'So Much More' is fundamentally a celebration of the deeply personal and particular vision of the artists who gently but forcefully remind us that we're all 'so much more' than our racial and ethnic identities," said Charles Kanwischer, director of the BGSU School of Art. Driskell's talk coincides with the final few days of the exhibit that is on display in the Willard Wankelman Gallery at the Fine Arts Center. Driskell, who has been a vibrant and vital force in contemporary art for six decades, has contributed significantly to scholarship on the history of the role of black artists in America. His accomplishments include three Rockefeller Foundation Fellowships, a National Humanities Medal, 13 honorary doctoral degrees and, most recently, he was named an American Academy for Arts and Sciences Fellow. The David C. Driskell Center for the Study of the African Diaspora was founded to promote his scholarship and service to the University of Maryland, where he is a Distinguished Professor Emeritus. Driskell also is an active artist, principally in collage and mixed media. Following his lecture, a reception will be held in the Fine Arts Center. The lecture and reception are free and open to the public. The art exhibition closes Oct. 21; gallery hours are Tuesday through Saturday 11 a.m. to 4 p.m., Thursdays from 6-9 p.m. and Sunday from 1-4 p.m.
Labels: Ohio Black Art Expert to Talk About Special Exhibit.